It is a Catholic tradition to acknowledge and honor the unselfish and holy life of the Blessed Virgin Mary. One way of doing that is for a family to plant, maintain and enjoy a Mary Garden. Now, many flowers that symbolize the name of Mary grace gardens throughout this country. If you, too, would like to honor our Blessed Mother through flowers, perhaps you would like to create your own special garden spot that showcases plants that carry her name. The center focus of the garden is a statue of Our Blessed Lady. The size of the garden does not matter. In fact, people with limited space can use a small area and a few select flowers to surround their statue. If you are an apartment dweller, you can set up your Mary Garden in a window box or even use a small statue with a single flowering plant. 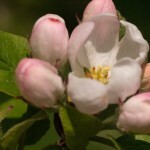 Reflecting on Marian flowers can be a perfect starting point for meditating on the life of Christ through Mary. 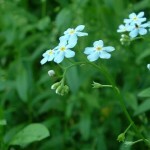 To help set up a Mary Garden, flowers and their meanings are listed below. 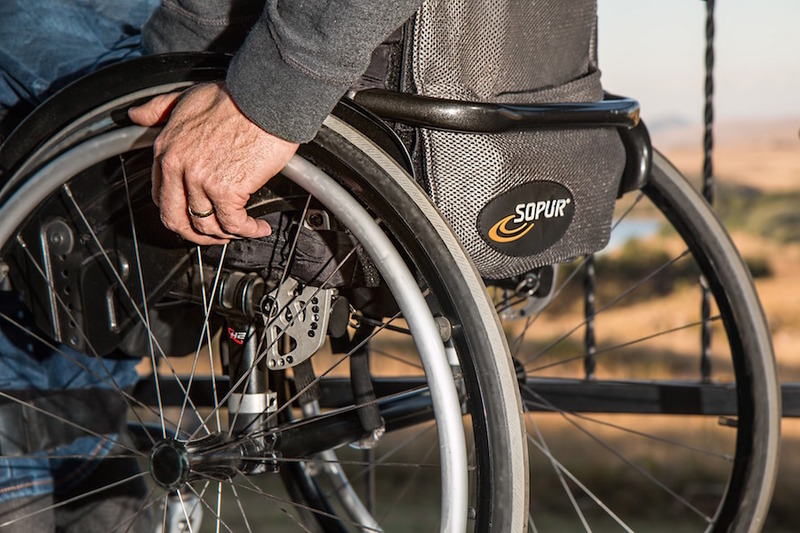 This list is far from complete but should give you enough information to begin. 1. Lily Legend tells us that the Angel Gabriel held a lily in his hands when he came to tell Mary that she was chosen to be the mother of the Savior. 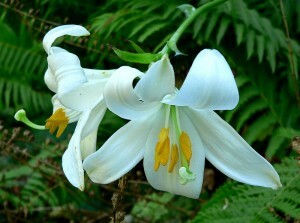 Lilies are often depicted in pictures of Mary as an indication of purity and grace. 2. Rose The rose symbolizes Mary as the Queen of Heaven. The red rose represents sorrow. 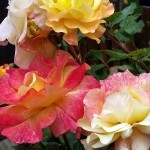 The white rose shows joy, and the yellow rose stands for the honor bestowed upon Mary. 3. Columbine This flower is often called Our Lady’s Shoe (not to be confused with the orchid-like Lady’s Slipper which is endangered in the wild). 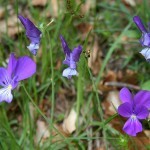 Legend says that this flower sprang from the earth where Mary’s feet stepped when she was on her way to visit Elizabeth. 5. 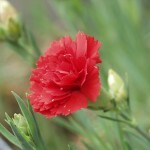 Carnation Legend says that the carnation bloomed on the night of Jesus’ birth; a sign of Mary’s joy at the Child’s birth. 6. 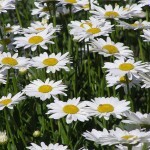 Oxeye Daisy It is said that when the wise men reached Bethlehem they looked for a further sign to guide them to the new king. King Melchior saw a white and gold flower and knew which building to enter. 7. 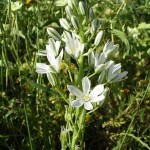 Star of Bethlehem: The shape of the flower is said to resemble the star that the Magi followed to find the Christ Child. 8. 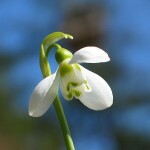 Snowdrop The snowdrop is said to have bloomed in February when Mary took Jesus to the temple to present him to God. 9. 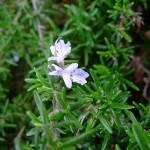 Rosemary It is believed that Mary hung the linens of the Holy Child on the rosemary bush to dry. Afterwards, the bush carried a sweet aroma. 10. Forget-me-not The tiny blue flowers of this plant represent Mary’s eyes. 11. Meadow Cress This plant is called Our Lady’s Smock. It stands for the fine linens made by Mary’s hands. It is said that Mary learned to weave as a young girl. 12. 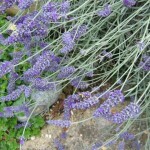 Lavender This fragrant plant represents purity, cleanliness and virtue – Mary’s spotlessness and chastity. 13. 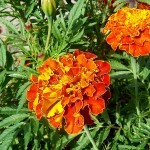 Marigold: Early Christians placed marigolds around statues of Mary in place of coins calling them Mary’s gold. 14. Bluebells These bell-shaped flowers resemble tiny thimbles and represent Our Lady’s working hands. They were often called Our Lady’s Thimbles. 15. 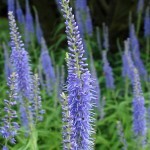 Speedwell: This plant is also known as Mary’s Resting Place. A legend tells that its blossoms marked each spot where the Blessed Mother rested during the flight into Egypt. 16. 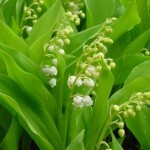 Lily of the Valley Lily of the Valley is called Our Lady’s Tears. It is said that her tears fell at the foot of the cross and turned into tiny fragrant blossoms. 17. 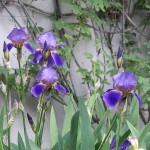 Iris The Iris is a flower, like the Lily, that represents the Annunciation. 18.Herbs Almost any herb can be used in your garden to represent Mary. 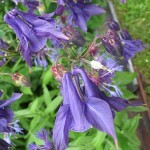 Soothing and healing herbs represent her heavenly love and mercy. Bitter or sour herbs represent her sorrows and sweet smelling herbs reflect Mary’s spiritual sweetness. 19. 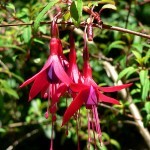 Fuchsia These gently drooping flowers resemble pendant earrings. It is said that the child Jesus playfully hung these flower ‘jewels’ on his mother’s ears. 20. 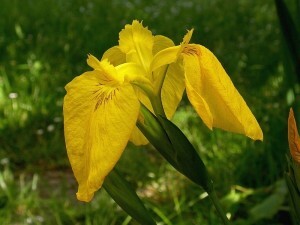 Fleur-de-Lis (yellow iris). 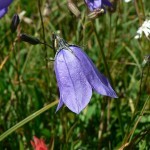 This is sometimes called the Ave Maria flower. There is a legend that tells of a fourteenth century knight. He was extremely wealthy but renounced his worldly possessions and entered a Cistercian Order of monks. He was very devout but not terribly smart. He could never remember more than the first two words of the Ave Maria prayer even though a teacher gave him numerous lessons. 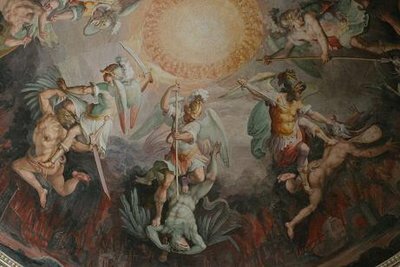 Since he loved Our Lady very much, he would continually repeat the first two words of the prayer, day and night: Ave Maria, Ave Maria. 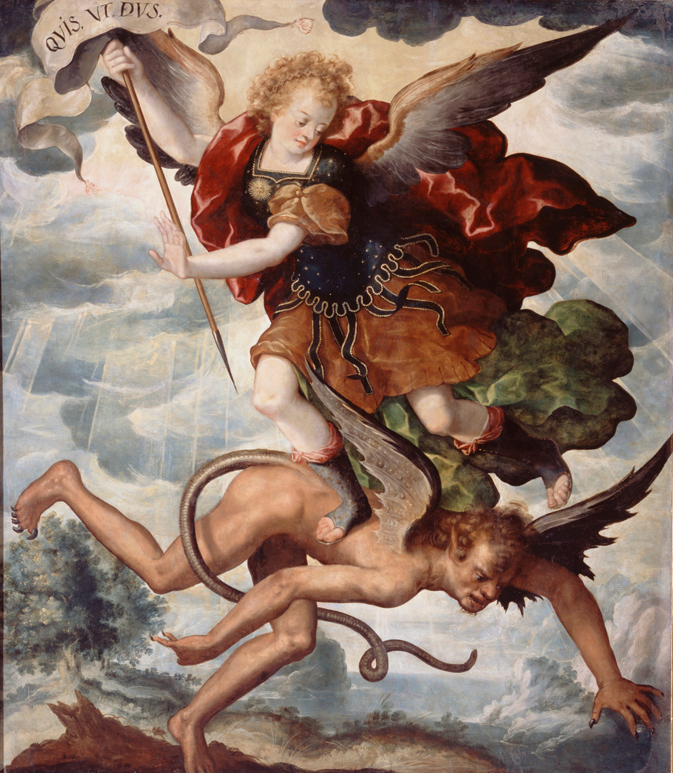 Some of the monks ridiculed him for his simplicity and told him that Mary would not listen to his unfinished prayer. He grew old and when he died, he was buried in the chapel yard of the monastery. As proof that Mary heard and loved his short but earnest prayer, a fleur-de-lis plant sprang up on his grave. On every flower shone in golden letters the words, Ave Maria. The other monks finally realized his great devotion for the Blessed Mother; and her devotion to him. This excerpt is taken from Mary: Ever Virgin, Full of Grace and is reprinted with permission.